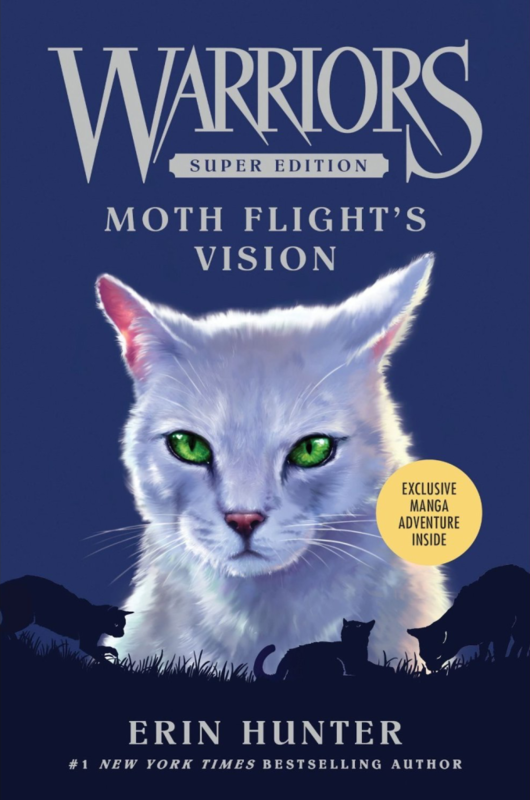 515 Responses to "Moth Flight’s Vision Spoiler Page"
Hi, Kate! Since this is the end for our DOTC characters in this series, do you think we’ll ever see them again. Also, do you think that Blackstar and Spider Paw are somehow related since they are both polydactyl cats? I mean Blackstar “comes from a long line of polydactyl cats, and has six toes on one of his back feet”. Well, so does Spider Paw. I know Spider Paw lives in RiverClan, but his sister lives in ShadowClan. It’s possible! I’m not sure if we’ll see the DOTC cats again. I do miss them though and I think there’s room for more stories about them. Dang. I wish there was a NZ version of Barnes&Noble. Book Depository takes forever to arrive!!!! I think there should be a novella on Micah and his dreams about Moth Flight and finally meeting her and stuff, like… I JUST WANT MORE OF MICAH HES MY BAB ;-; WHYD YOU HAVE TO KILL HIM. Kate, when did this book come out? I haven’t seen any of my bookstores carrying it and nth ing on the warrior cats page! Everyone is talking about the new arc like they’ve read it already! Help?! Kate, did Tiny Branch go to StarClan after he died? Also, do you think he gave Clear Sky one of his nine lives?